A set of statistically downscaled climate and hydrologic projections for all watersheds draining into the North Pacific, from Southern California, through the Bering Strait, to Japan. Projections are implemented at daily temporal resolution and a spatial resolution of 0.5 degree (~55 km2). The projections stem from the CMIP3 global model archive, and are based on six global models, two statistical downscaling approaches, and two greenhouse gas scenarios (B1 and A1B). Natural resource managers face substantial challenges when trying to assess the vulnerability of terrestrial and nearshore ecosystems to climate change. Some of the largest limitations arising from projections of climate change stem from the scale and uncertainties associated with climate model output. This project addresses these common problems by creating an internally consistent set of downscaled climate and hydrologic projections for all watersheds that drain into the north Pacific ocean from California through the Bering Straight to Japan (Figure 1). The dataset is produced at a daily time step and a spatial resolution of 0.5 degrees (~55 km2), and combines climate projections from the Intergovernmental Panel on Climate Change (IPCC, 2007) with hydrological simulations using the Variable Infiltration Capacity (VIC; Gao et al., 2010; Liang et al., 1994) hydrologic model. Figure 1 The domain selected for this study (medium gray), which includes all watersheds that drain into the north Pacific Ocean, defined as the portion of the basin north of 32N. Four calibration watersheds are also highlighted (light gray): the Yukon, Skeena, Fraser, and Sacramento river watersheds. These were used to calibrate the hydrologic model. Figure source: Mantua et al., in prep. As part of the Riverscape Analysis Project, a team of researchers at the University of Montana used the downscaled climate projections as an input to a stream temperature model. The results are available for download via an interactive mapping tool (Figure 2). 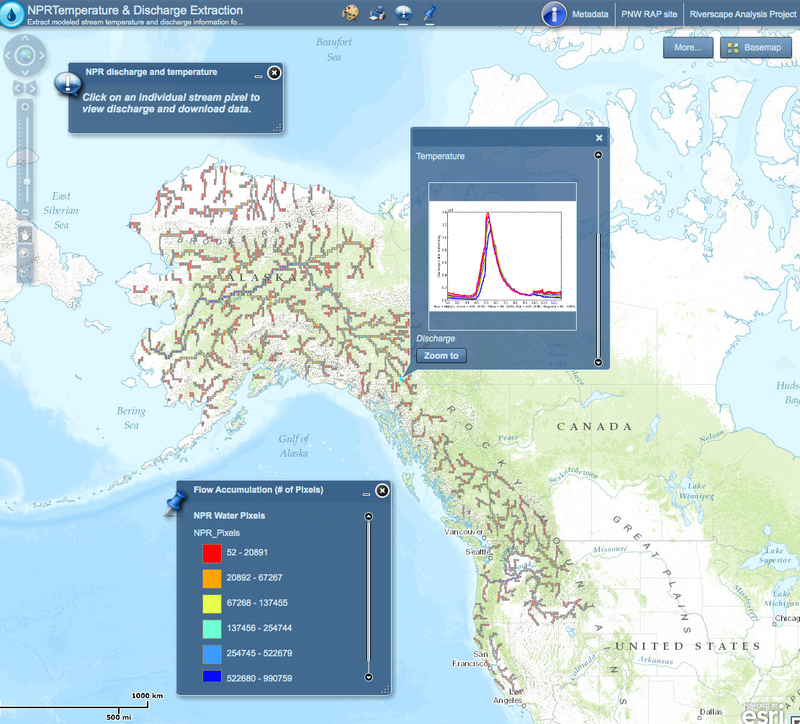 Users can click on any stream segment to download historical and future projected changes in streamflow and stream temperature. Figure 2 The Riverscape Analysis Project interactive mapping tool. Although originally motivated by a need to assess climate impacts on salmon across the entire Pacific Rim, this dataset could be useful in other applications that require a consistent approach across disparate locations along the Pacific Rim. For example, the domain for the North Pacific Landscape Conservation Cooperative (NPLCC) is entirely covered by this dataset. We developed a gridded daily historical (1948-2000) dataset based on the Climate Research Unit (CRU; Jones et al., 1994) for temperature and Njissen et al. (2001) for precipitation. Corrections were applied to the data based on streamflow comparisons, and comparisons with regional gridded climate datasets in Alaska (SNAP, 2011), British Columbia (Werner, 2011), the Pacific Northwest (Elsner et al., 2010) and the coterminous U.S. (Daly et al., 2002). The resulting database was developed at a resolution that is a compromise between the sparse data available at northern latitudes and the spatial scales required to inform management decisions. Projections of future climate were obtained from global climate model (GCM) simulations archived as part of the IPCC AR4 assessment, under the A1B and B1 greenhouse gas scenarios (Nakicenovic et al. 2000; for more on greenhouse gas scenarios, follow this link). Six GCMs were chosen for use in the present study: CGCM 3.1 (T47), CGCM 3.1 (T63), ECHAM5, HADCM, GFDL CM2.1, and MIROC 3.2. Data (monthly average temperature, precipitation) from the GCMs were statistically downscaled to the output 0.5 degree resolution using two methods of statistical downscaling: the Modified Delta (SD; described in Littell et al., 2011) and Bias Correction and Statistical Downscaling (BCSD; described in Hamlet et al., 2010) methods of downscaling. Downscaled climate projections were used with the Variable Infiltration Capacity (VIC) hydrologic model to calculate impacts on hydrology (e.g., snow water equivalent, soil moisture, evapotranspiration, runoff). The VIC model was calibrated over four watersheds included in this study: the Yukon, the Skeena, the Fraser and the Sacramento. The VIC-simulated streamflows for each study basin were calibrated to natural (unregulated) streamflow data on a monthly time step (Matheussen et al. 2000). The calibrated flows trace the historical record more closely, depending on the various parameters used in the calibration procedure. The result is a set of internally consistent downscaled climate and hydrologic projections at 0.5 degree resolution over the entire domain of the North Pacific Rim. The forcing data, used to drive the hydrologic model, are available in raw form, subsampled to 0.125 degree (~15 km), as well as summarized to monthly time scales at the native dataset resolution of 0.5 degree. Monthly summaries of hydrologic products are also archived for download at 0.5 degree. We are currently preparing a manuscript that details the development of this dataset (Mantua et al., in prep), associated products, and highlights a few example results. In addition, a detailed README file (linked below) is included in the data repository. Historical and future projections of sea surface temperature (SST) are provided, obtained at 1 degree (~100 km) resolution from the HadISST dataset (v1.1, Rayner et al., 2003) and Aziz et al. (2011). Historical and future projected SST data were only produced for the months of July, August, and December. Funding for this project was provided by a grant from the Gordon and Betty Moore Foundation via the National Center for Ecological Analysis and Synthesis (NCEAS) at the University of California, Santa Barbara, and from the US Forest Service Pacific Northwest Research Station. Updates to this project can be found here. We are currently preparing a manuscript that details the development of this dataset (Mantua et al., in prep), associated products, and highlights a few example results. A draft of the manuscript can be downloaded here. In addition, a detailed README file is included in the data repository. Daly, C. et al., 2002: A knowledge-based approach to the statistical mapping of climate. Climate Research, 22 (2), 99-113. Elsner et al., 2010: Implications for 21st century climate change for the hydrology of Washington state. Climatic Change, 102 (1-2), 225-260. Gao, Huilin, Qiuhong Tang, Xiaogang Shi, Chunmei Zhu, Ted Bohn, Fengge Su, Justin Sheffield, Ming Pan, Dennis Lettenmaier, and Eric F. Wood. “Water Budget Record from Variable Infiltration Capacity (VIC) Model Algorithm Theoretical Basis Document.” Dept. Civil and Environmental Eng., Univ. Washington, Seattle, WA (2009): 09-18. Hamlet A.F. et al., 2010: Statistical downscaling techniques for global climate model simulations of temperature and precipitation with application to water resources planning studies. Chapter 4 in Final Project Report for the Columbia Basin Climate Change Scenarios Project. (IPCC) Intergovernmental Panel on Climate Change. 2007. Climate Change 2007: The Physical Science Basis. Contribution of Working Group I to the Fourth Assessment Report of the Intergovernmental Panel on Climate Change [Solomon, S., D. Qin, M. Manning, Z. Chen, M. Marquis, K.B. Averyt, M. Tignor and H.L. Miller (eds.)]. Cambridge University Press, Cambridge, United Kingdom and New York, NY, USA. Jones, P.D., 1994: Hemispheric surface air temperature variations: A reanalysis and an update to 1993. J. Climate, 7, 1794-1802. Liang, X., D. P. Lettenmaier, E. F. Wood, and S. J. Burges, 1994: A Simple hydrologically Based Model of Land Surface Water and Energy Fluxes for GSMs, J. Geophys. Res., 99(D7), 14,415-14,428. Mantua N. et al., 2012: Climate and Hydrologic Change for the North Pacific Rim: A new dataset for climate impacts assessment. Manuscript in preparation. ects of land cover change on stream ow in the interior Columbia River Basin (USA and canada). Hydrological Processes 14(5): 867-885. Nakicenovic, N et al. (2000). Special Report on Emissions Scenarios: A Special Report of Working Group III of the Intergovernmental Panel on Climate Change. Nijssen, B. et al., 2001: Global retrospective estimation of soil moisture using the variable infiltration capacity land surface model, 1980-93. J. Climate, 14, 1790-1808. SNAP (2011). Scenarios Network for Alaska and Arctic Planning. Retrieved March, 2011. Werner, A.T., 2011: BCSD Downscaled Transient Climate Projections for Eight Select GCMs over British Columbia, Canada. Pacific Climate Impacts Consortium, University of Victoria, Victoria, BC, 63 pp.